Our apartments are on the beach of Agios Giannis, on the west side of Lemnos 6.5km from the Islands Capital Myrina and 1.5km from the nearest village Kaspaka. From all the buildings you can see the blue from the Aegean Sea. The balconies on the back side have a view to the mountain and sometimes you can see the sheep and donkey from the nearby farmer. From the balconies during the day, you can see the sunlight playing games with the sea and the surrounding mountains. We have a sunset view of Mount Athos. Walking down the hill for about 250m, you arrive to the lovely beaches of Ai Gianni, Tourkos with its shallow sandy waters, Prasa with its small port and the lonely Karvounolaka with its peaceful shore. If you wish to explore Lemnos there are magnificent beaches all over the island. Within walking distance from our apartments there are 3 taverns, practically on the shore. 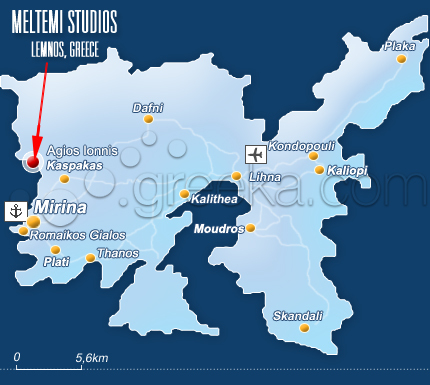 If you are planning to visit Lemnos, we will welcome you at our traditional family business.